Speed Queen’s history goes back more than a century: 100 years of experience, during which time this brand of washing machine has won Americans’ unconditional trust. With the support of Alliance Laundry Systems, in 2014 Speed Queen launched its concept of international laundries: ultra-modern laundromats, designed to ensure optimal customer experience. In contrast to other players in the sector, Speed Queen manufactures its own machines and deals directly with investors, without any intermediaries. Speed Queen machines have long been renowned for their performance. Thanks to decades of research, development and radical innovations, Speed Queen washing machines and dryers are unbeaten for their durability and exceptional value. Some American homes have been using the same machine for over 25 years and consider their washing machines authentic collector’s items. And with good reason, with professional and industrial quality offered in products intended for the general public. For the 4th consecutive year, in 2017 Speed Queen won the Women’s Choice Award, making it the best brand of washing machine according to Americans. Shortly after this, Speed Queen also received favorable mention in the European press (French magazine Capital, Spanish newspaper La Vanguardia, and Portuguese newspaper Espresso), thanks to its laundromat concept. Choice of equipment and arrangement of the machines. Alone amongst laundry franchisors, Speed Queen is the only brand to manufacture its own machines and cut out all intermediaries. 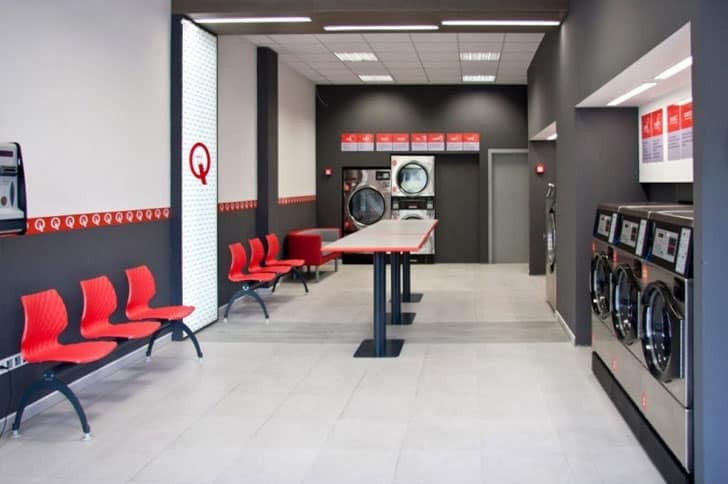 The Speed Queen concept is a turnkey solution that is spreading across Europe: opening a laundromat is a profitable enterprise and one which requires relatively little management (no personnel costs, cash management for essential costs). You are completely free to run another activity at the same time, since it is not necessary to be on site 24/24: just take care of the opening and closing and be on call in case of problems. How do you explain the success of Speed Queen laundries, at a time where most of us have a washing machine at home? The answer is simpler than it seems. First, because not all households do have a washing machine, either because they can’t afford it or because of a deliberate choice. Secondly, because using a laundromat saves time (the average cycle lasts 1 hour, including drying) and money (you can wash more than 20 kg of laundry at once, compared with 5 kg using a domestic machine). With Speed Queen laundries, you can wash large items of laundry, such as comforters and curtains, which are impossible to wash in a domestic machine. Speed Queen laundries don’t only attract students. The clientele is varied and the demand is constant and includes pensioners and executives as well as large families. A laundry is an excellent business proposition, combining moderate investment with good profitability in the medium and long term. Location is a determining factor in your success: most users go to the laundromat on foot and the laundry draws its customers from the immediate neighborhood. Speed Queen industrial laundry experts assist you in undertaking market research and help you choose the best possible location. Speed Queen seeks to constantly improve its customers’ user-experience, with ever-increasing machine efficiency, support and guidance to investors and the creation of ergonomic and welcoming premises.